With a renewed focus on domestic energy sources and a growing interest in renewable energy, the solar industry is anticipating new demand for photo-voltaic solar panels (Solar PV). Manufacturers need to test performance of their panels under various conditions to make sure they will deliver safe and efficient energy to consumers and businesses. Before manufacturers proceed to mass production they often send their panels off to third party testing facilities to verify that the panels operate safely under standardized testing conditions. This solar panel test application using Yokogawa MX100 hardware and MXLogger software is based at one of the major third party testing laboratories in the United States of America. 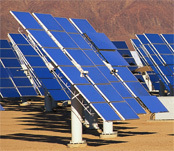 The test laboratory was already using Yokogawa paperless digital recorders on its environmental test chambers with good success and was interested in what Yokogawa had to offer for solar panel test applications. The laboratory needed a data acquisition system that was flexible in terms of input types, operating temperatures, and portability. 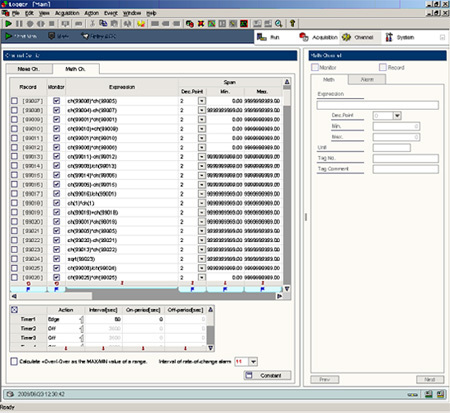 Another major requirement was that the data acquisition support real-time calculations and logic based on inputs. The existing data acquisition system was very basic in that it could only record input data without applying any logic or processing to what it was sampling. The laboratory's requirement for input processing is primarily focused on stability of test conditions – whether this is wind, temperature, or radiance. Once the data acquisitions processing system determines test conditions meet stability requirements then it can start a timer to determine if the test has run an appropriate amount of time and notify the operator that the test is complete. After reviewing the customers requirements, two data acquisition systems based on the same backplane and I/O module technology were considered. The MX100 is a network PC based data acquisition system where all recording, configuration, and input processing are performed on the PC. The other system considered was the MW100 which moves the recording, configuration, and input processing onto the Yokogawa hardware. The major difference between the two systems is that the MW100 can record and process data independently of the PC and network while the MX100 requires a network and PC at all times. In the end the MX100 was determined to be the best choice as it supported more real-time input processing capabilities due to the fact that it could take advantage of the powerful CPU found on the host PC. The MX100 has a wide variety of input and output modules, but the most commonly deployed is a universal input module. The universal input module can have each individual point configured as a thermocouple, RTD, DC voltage, DC current (through shunt resistor), or digital input (level or contact). The MX100 can sample its universal input module as fast as 10 ms per point for high-speed modules, 100 ms per point for standard modules, and 500ms per point for high channel count modules. The MX100 also supports slower sampling rates for any of its input modules and each module can have its own independent sampling rate with up to 60 inputs per MX100 backplane. The universal input modules with built-in channel scaling were especially important for solar test as some of the inputs like the radiance from the pyranometer were in millivolts (scaled to W/m2); wind speed from the anemometer was in volts (scaled to m/s), and temperatures were measured by several thermocouples (scaled to °F).